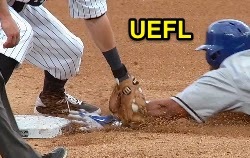 Instant Replay Review overturned 3B Umpire Ed Hickox's safe call in the top of the 1st, 2B Umpire Ron Kulpa's safe call in the top of the 5th and 1B Umpire Jeff Gosney's safe call in the bottom of the 6th inning of the Rangers-Tigers game. In the 1st, with one out and one on, Rangers batter Mitch Moreland struck out swinging on a 3-2 changeup from Tigers pitcher Rick Porcello as Rangers baserunner R2 Shin-Soo Choo attempted to steal third base off Tigers catcher Alex Avila, who threw to third baseman Nick Castellanos as Choo slid into the bag. Upon Replay Review as the result of a challenge by Tigers Manager Brad Ausmus, Hickox's ruling was reversed, the call was incorrect. At the time of the review, the contest was tied, 0-0. In the 5th, with none out and one on, Rangers baserunner R1 Elvis Andrus attempted to steal second base off Tigers catcher Avila, who threw to shortstop Andrew Romine as Andrus slid into the bag. Upon Replay Review as the result of a challenge by Tigers Manager Ausmus, Kulpa's ruling was reversed, the call was incorrect. At the time of the review, the Rangers were leading, 4-1. In the 6th, with one out and three on, Tigers batter Castellanos hit a 1-0 fastball from Rangers pitcher Nick Martinez on a line drive to second baseman Rougned Odor, who threw to first baseman Moreland as Tigers baserunner R1 Avila attempted to return to first base. Upon Replay Review as the result of a challenge by Rangers Manager Ron Washington, Gosney's ruling was reversed, the call was incorrect. At the time of the review, the Rangers were leading, 8-1. The Rangers ultimately won the contest, 12-2. This is Ed Hickox (15)'s fourth Replay Review of the 2014 MLB Regular Season. This is Ron Kulpa (46)'s third Replay Review of the 2014 MLB Regular Season. This is Jeff Gosney (40)'s second Replay Review of the 2014 MLB Regular Season. This is Crew Chief Ron Kulpa's second, third, fourth supervised Replay Review of the 2014 season. 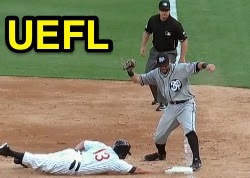 This is the 360th, 361st, 362nd Instant Replay Review of the 2014 MLB Regular Season. This is Tigers Manager Brad Ausmus' 13th, 14th Replay Review of 2014. This is Rangers Manager Ron Washington's 12th Replay Review of 2014. Umpires are now 186/362 (.516 Affirmation Rate) in Replay Reviews during the 2014 MLB season.